Miguel hasn't released a full-length project since his album Wildheart dropped in 2015. However, that may be set to change with the singer telling Snoop Dogg that he's currently finishing work on something new. He appeared as a guest on Snoop's GGN show on Monday where he spilled some early details on what he has in the pipeline. “Right now, [I’m] just wrapping up a project," Miguel said. "I feel like I’ve been creating three projects simultaneously. So the one that’s the most complete is kind of what I’m wrapping up now.” He then played a short clip of his as-yet-untitled next single for his host. Check out the full interview above. The new music arrives around the 12m mark. 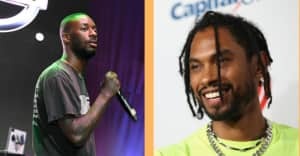 Miguel has appeared on three singles so far in 2017, collaborating with DJ Premier for "2 LOVIN U" before hooking up with RL Grime on “Stay For It” and Dua Lipa for her track “Lost in the Light” respectively.